This years Guys Weekend Ed, Kev, and I took RoadAbode down to Abingdon Maryland to relax at Bar Harbor RV Park & Marina. The beauty of this place is location. Situated on the Bush River, a feeder to the Upper Chesapeake, the RV sites face toward a boardwalk along the banks of the river. One of the few campsites where we keep the driver area curtain open because of the view out over the water. Egrets, heron, hawks and other feathery wildlife abound in this quiet place. Friday Ed and I headed out about noon to RoadAbode. We stowed our gear, and headed for Kev. Kev was waiting for Leann to get home to "tag Team" for caring for thier son, who was under the weather. It was nice to just sit and talk, and let Ed see the beautiful garden at Kev's home - even though I was itching to get on the road. Once Kev's gear was stowed and we were on our way, the trip south from Souderton was uneventful - which is usually for the best. Google Maps decided that the best way to skirt the traffic mess of the Blue route to i-95 was to hit Route 30 towards Lancaster and then south on Route 10. I think it was a little longer of a trip, but the scenery and driving was much more appealing. The route dropped us on i-95 slightly above the Millard E. Tydings Memorial Bridge, which crosses over the Susquehanna River. Another 20 minutes and we were at the campground. Once we setup our site and took a stroll around the shoreline and park, we headed out to Pat's Pizza. for dinner. A great little eatery recently refurbished with great oven baked specialty pizzas. IT may be our age, but we couldn't finish the Stuffed steak pizza we ordered, and had to take some slices back with us. We stopped for some supplies and introduced Ed to an Aldi market. Last stop for the eve was for some ice at the Seven-Eleven on the road leading to the campground. Once back we relaxed outside with a campfire and some adult beverages. Had some fun looking thru the High School yearbook Ed brought. Saturday we visited the town of Havre de Grace. A great little town where the Susquehanna empties into the Chesapeake. Some of the highlights for us there were the Visitors Center - where we learned of some of the revolutionary war history of the town - the river walk from the lighthouse to the town marina, and a wonderfully tasty family owned restaurant called El Jalapeno For dessert (and treats for home) we stopped in Bomboy's Candies. A little on the pricey side, but worth it - and the $5 grab bags hold some yummy treasures! Dinner was at the local Golden Coral, We jokingly mention we were "seniors". When we sat at the table - we saw we got a discount! Sunday, We traveled to Susquehanna State Park and walked the abandoned rails along the river, and investigated the old Rock Run Grist Mill. 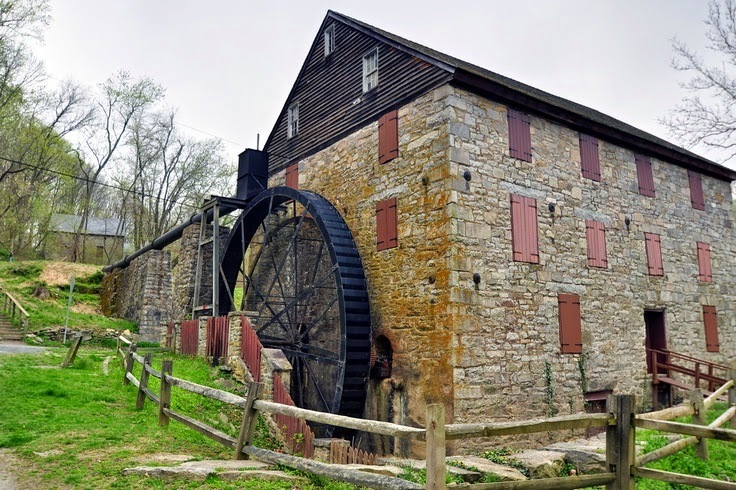 This mill was erected by John Stump in 1794. The engineering of the conveyor elevators, sifting machinery, and how the grains were made into flour was amazing to see in the water driven mill. After we stopped at the only winery.in the area, Mt. Felix winery.A bumpy dirt road led us to an Italian inspired villa atop a hill with a beautiful view of the grapes and the Chesapeake beyond. We samples, then bough a bottle a d sat at an outside table, while listening to opera. The winery may not have the most delectable of wines, but it was quite a relaxing and fun time! Dinner was Joe's Crab Shack where I was able to dine on they're Cajun prawn special. Not Maryland crab but still a great treat. Back at the RV Park we enjoyed a swim and more a taste of a few whiskeys. Not a everyday thing for any of us, but interesting to sample and appreciate the different flavor notes of each. Monday we had breakfast at an old favorite - Waffle House - and then packed up and headed home. Another relaxing Guys Weekend!